I'm pretty excited about Thanksgiving coming up. The family! The fun! The food! Okay, right now I'm especially excited about the food, because I'm hungry; an entire box of Pop Tarts isn't as filling as you'd think. I'm craving that turkey, the cranberry sauce, some stuffing - even the green bean casserole. The only downside to holiday dinners is the possibility of getting stuck next to someone who doesn't know how to behave at the table (not in my family, of course - ahem - but I'm sure that's a legitimate problem somewhere out there... cough cough). Labels: Are you TRYING to make me crazy?, family, food, helpful tips, holidays, humor, In The Powder Room, List Lover, memes are fun-ny, pet peeves, There might be something wrong with my head. 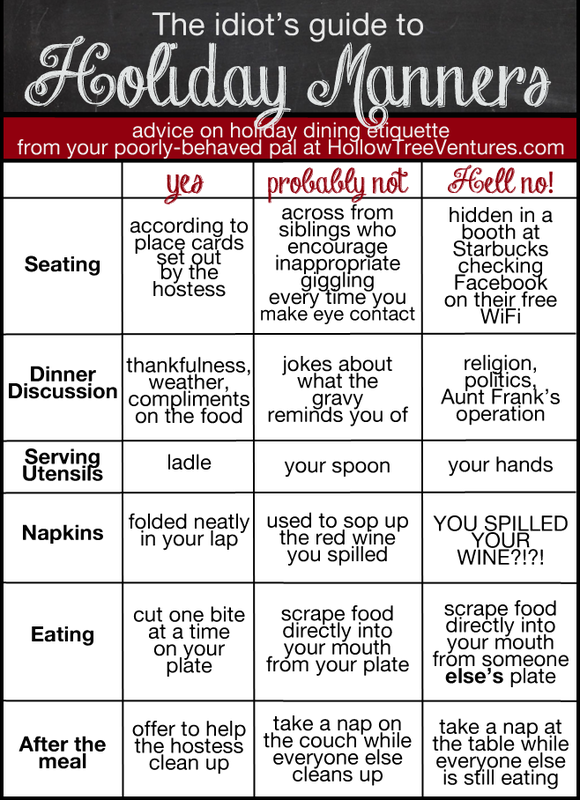 I'm just relieved "Scraping food from plate directly into mouth" made the cut. I now feel validated and un-alone. I couldn't rule it out completely - it isn't my fault the last few kernels of corn are impossible to stab with a fork! These rules are SO strict! !